Bummer! You lost a deal. Switch it to Lost and put down a short reason why this happened and also potentially a comment. If the same reason happens the next time, you’ll have it predefined in a dropdown list. 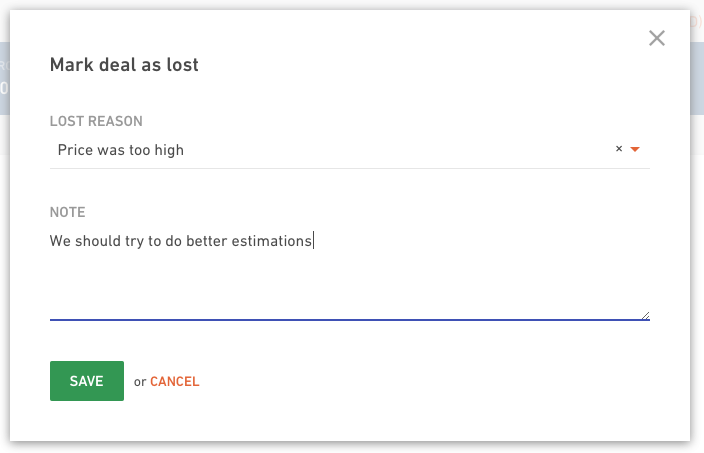 No need to write it again and again and we’ll be upgrading this feature with meaningful stats in the future (so you’ll be able to get reports on what are the most common reasons why you’re losing Deals). You can view and edit the lost reason at any time by visiting the Deal page. Also, you can manage your Lost reasons by visiting Settings -> Lost Reasons.